For those who do a lot of metal or construction work, an angle grinder is an essential tool. You’ll see them in most workshops or building sites where they are used to polish metal or remove excess pieces of material. If you’re new to these types of power tools, you might be wondering how to use a grinder. In this article, we will be explaining what they are, what they do, as well as the best way to achieve the results you are looking for. Angle Grinders are special power tools that have a spinning blade that allows you to grind, cut, or polish hard materials including metal, steel, and tiles. There are lots of different types available, though, depending on your preference and the type of project you are working on. The main differences are found in the size of the disc and how powerful the motor is. However, there are other options when it comes to the power source (which can be electric or pneumatic) and how fast the disc spins (the rpm). Normally, pneumatic powered grinders are better suited to smaller and more precise jobs, whereas electric ones are better for larger projects. 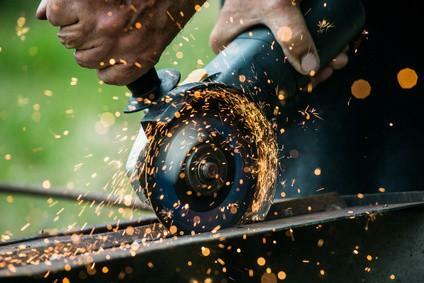 Most tool manufacturers make angle grinders, with the only real differences coming from the amount of power, build quality, cost, and durability. Cut tough materials like sheets of steel, rusted bolts, rods, bricks, tiles, slabs. Sharpening edges on blades, spears or axes. Smoothing surfaces by removing paint, debris, and rust. Abrasive Discs – These replaceable discs are made from sandpaper with an attachment on the rear to keep it mounted on the grinder. They are available in whatever coarseness you need and can be used to smooth down different types of surfaces. Once they wear out they can easily be replaced. Grinding Discs – These are available in various shapes and sizes, which are designed to work on metal or stone. They are also used to grind the material and turn it into a uniform shape. Flap Sanding Discs – These are mainly used to sand the surface, but it also has a slight grinding effect. Therefore, it can be a better choice when working with delicate materials or when you need to be particularly precise. Polishing Pads – Used on delicate surfaces, such as paintwork, for polishing. With all of this in mind, it’s easy to get started with your angle grinder to cut metal. Of course, the more you practice the better you will get, but even your first attempt shouldn’t be too problematic. First, you must be aware of the type of metal that you are working with and what you want to do with it. This will determine the type of disc that you need. If you want to cut a length of rebar, for example, you will need to attach a metal cut-off disc to the grinder. Next, attach the piece of rebar firmly within a clamp so there is no risk of it getting free. Ensure that the place where you will be making the cut is clear from the clamp. Now, you’re ready to cut. Slowly lower the grinder over the rebar and let the weight of the tool do all the work. Be ready to let the free end of the bar drop to the ground without getting in the way. Angle Grinders are versatile tools that can be used to cut or grind a wide variety of materials in place of more specialised tools. By changing the discs as required, an angle grinder will do a great job in a short time. This lets you focus on the other elements to your project. It doesn’t take long to learn how to use a grinder, but with practice, you can unlock the full potential of this great tool.